Real talk: Ever since I got into skincare, traveling has been one hell of a challenge. Here’s the thing. I love travel, even air travel, even air travel in coach with multiple layovers! I like going places! But uhhh…shoehorning even “just the necessities” (LOL) of my skincare wardrobe into a carry-on while leaving room for other things would be impossible even if TSA liquid restrictions weren’t in play. I’ve got a laziness block against doing lots of decanting and labeling (and also my pretty bottles are part of my overall skincare experience, sue me). And packing everything into a checked bag? I dunno about that. It’s not so much that I’m a cheapass who doesn’t really want to check bags if I can avoid it, though that is a factor, so much as it is my fear of the very real possibility that my checked bag might get lost with all my skincare stuff in it for God knows how long and I can’t have that. I know. I’m difficult. I bet I’m not the only one who’s had these thoughts, though. So I was thinking about the travel dilemma recently and thinking about how nice it is that I can bring balm and powder cleansers in any size past airport security without triggering a deep cavity search. I was, at the same time, tossing box ideas around with Memebox. That’s how the Snails on a Plane box was born. And now it’s available on Memebox for your traveling pleasure! As always, I have tested and approved every item in this box, and it includes several of my favorites! The best thing about it (in my opinion) is that only one item in it, the Sulwhasoo Overnight Vitalizing Mask, counts towards your TSA liquids total, and at 30ml travel size, that leaves plenty of room for you to customize your skincare baggie with whatever ampoules and serums and creams you just can’t leave behind–or room for other goodies if the skincare routine in Snails on a Plane is all you need! A box of five pairs of Mediheal E.G.T. Essence Eyefill Patch hydrogel eye masks, which I tried out specifically for consideration for this box and liked a lot. They definitely smoothed out and woke up my undereye area after some late nights! And the aforementioned 30ml travel size Sulwhasoo Overnight Vitalizing Mask, which is so legendary that I don’t even know what to say about it that isn’t already in the rave reviews written by my friends Kerry from Skin and Tonics and Sheryll from The Wanderlust Project. The way I would use this mask during travel is as a sleeping pack at night and in a thinner layer as a day cream. Snails on a Plane is available at Memebox for $26 (affiliate link), but if you want to take a chance and see if you can win one, head on over to my Instagram account to enter this week’s giveaway! Finally, although I wasn’t directly involved in the curation for the new Fifty Shades of Sheet Masks special vault box, I do feel like I should say something, because I feel like…my terrible sheet mask obsession might have been an inspiration. This is a limited-quantity box of 50 sheet masks for $49 (affiliate link), so you might want to jump on that if you’re looking to grow your sheet mask collection or snag a bunch to give out over the holidays. Happy travels and happy masking! Affiliate links in this post generate commissions that support Fifty Shades of Snail and Fiddy’s further skincare adventures. Full disclosures can be found here. Omfg Fiddy I’m sooooo dead. Traveling with your skincare can get stressful & that Sulwhasoo is definitely a travel fave! Totally have to try these Tosowoong goodies though, especially the enzyme powder so I can compare to the Sum37 & Amore Pacific ones I love so much! You know, Tiffany, as opposed to the “just the tip” cavity searches you get when you set off the metal detector or something. Urgh. This was in my bag on Memebox and I was in the middle of checking out when it went out of stock! I’ll just have to bide my time and hope it comes back…. because I am so excited to try all of these products! Yes; it literally happened about 3 minutes before I posted that comment. It’s pretty amazing how popular it was! But it makes me sad that I missed getting it. Do you know if it’ll be back? So I got word that they’ll be back in stock soon! I’ll try to announce it on my social media when they are. Keep these boxes coming! They’re awesome! I ordered the Cosrx snail one and am waiting (impatiently) for it to get here! Boo! 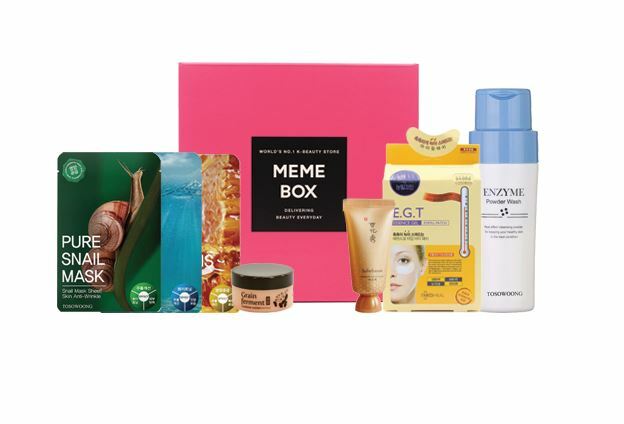 I went to order this box the other day from Memebox and it was out of stock. When I asked if they would restock it they told me they probably wouldn’t. I missed out! Will there be more Fiddy boxes in the future?